It's just about March, so today we're rolling out the March releases with a blog hop!!! I am soooooo excited with this release! Fun, fun stuff! Speaking of fun, how fun is this? 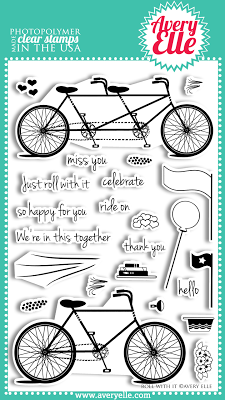 I have been waiting and waiting for a bicycle set, and Jamie must have read my mind:) How cool are these stamps? This is one of those sets that the stamps just speak for themselves. No fancy techniques needed;) For this card, I stamped the bike onto watercolor paper using Versacolor ink (which will not run using watercolors/water-based inks). I just love how crisp that bike stamp image is! Using some of my Stampin Up water-based inks, I painted the background. If you look closely, I did a little splatter painting to simulate raindrops. As a little detail, I fussy cut the flag (splattered a bit of "rain" on it) and glued it to the card base. To simulate a flag, I used foam tape the trailing edge of the flag and scortape on the side of the flag attached to the flag pole. Love the way it looks like it's waving! Thank you so much for stopping by and I hope you enjoy the blog hop! 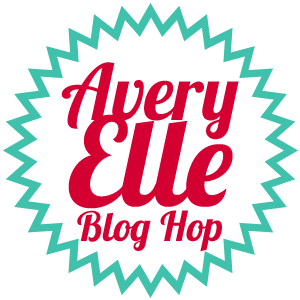 Click on over to the other Avery Elle gals to see the new releases in action! This month we have the fantastic Donna Mikasa playing along with us! 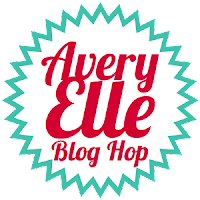 To celebrate the March Release Blog Hop, Avery Elle is giving away and $25 Gift Certificate to one winner on the Avery Elle blog and another $25 Gift Certificate to a winner on Facebook (just share them with your friends and make sure they say you sent them). You have until Sunday, March 3rd to enter. The winner will be announced on the Avery Elle blog on Monday, March 4th. All products will be available for purchase tonight at midnight EST. This is so cool, JJ. Love the watercolor and crisp bike image with that tiny flag. Awesome. LOVE this JJ....So Pretty the WC background is just Perfect!!! This is just lovely JJ - love your rainy background and the little flag off the back of the bike! I love this card, JJ! The watercolour background is awesome. Love that waving flag. SUCH a pretty card! I am so loving the double bike!!! I like the new flowers best, but this is a very cute card! LOVE the watercoloring, great card JJ, so sweet! Cute!!! Love the background, and the little flag is just adorable!!! Love the watercolor scene! Beautiful work!! What a fabulous background for the bike! This is so C&S JJ but it really doesn't need another single thing! I love the background and that flag - Ride On! I am LOVING that watercolor background! TFS this lovely idea!!! Such a pretty card! Love the watercoloring! Lovely card! Love the watercolor and flag on the bike. Wow...Your card is amazing...I love the water color back ground. I like the rain look for the background! Very fun! What a great scene - love the sentiment with the bike! Fantastic card and the water colored background is beautiful!! Loving this great bie set! This is too adorable! Love! Love the watercolor background, and perfect touch with the "waving" flag! Hi, NoVa neighbor! The watercolor background is wonderful. I love that the bike includes the shadow; at first I thought you had drawn it! I need these bikes:) Love your watercolor background! Love the look of the watercolour on this card and how creative with the waving flag! very cute!! I'm so glad to see someone use that bike, I love it! Wow do I ever love your watercolor background! Such a spring card! JJ, I love your card! Your watercolor background is beautiful!! I so love your creations, JJ! 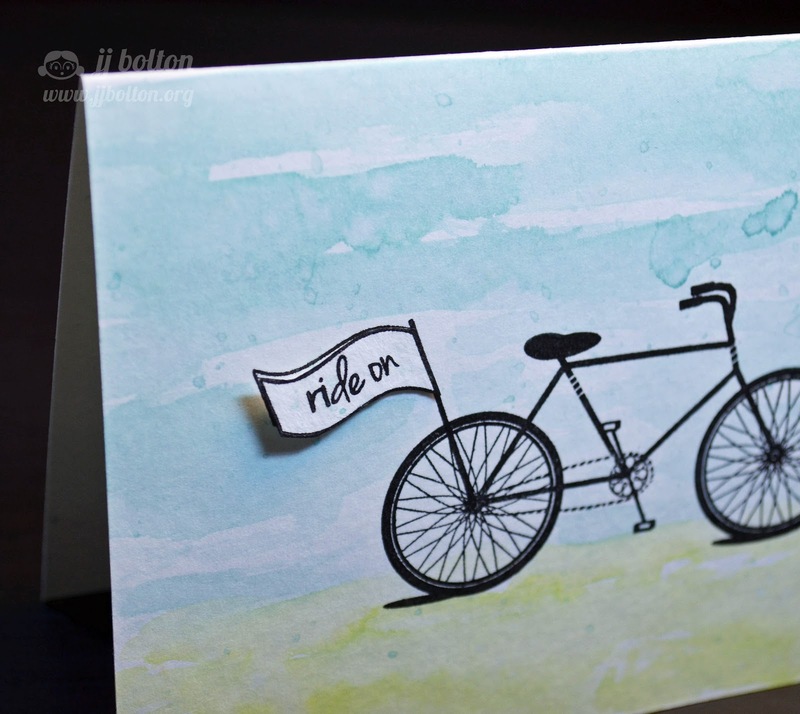 The simple bike stamp against the interesting watercolor is just striking! What a great card! I like the watercolor background with the droplets, it looks like a turn of the century artwork! JJ- You always inspire me to try new techniques (even if they might be a bit messy!!). I am truly so happy that you are a part of the Avery Elle team. Here is to great things to come!! Thanks for the inspiration. Super cute, JJ! I love the watercoloring! Love all the stamps in this set and your wonderful card! Just beautiful--I love the water coloring. Cool card! 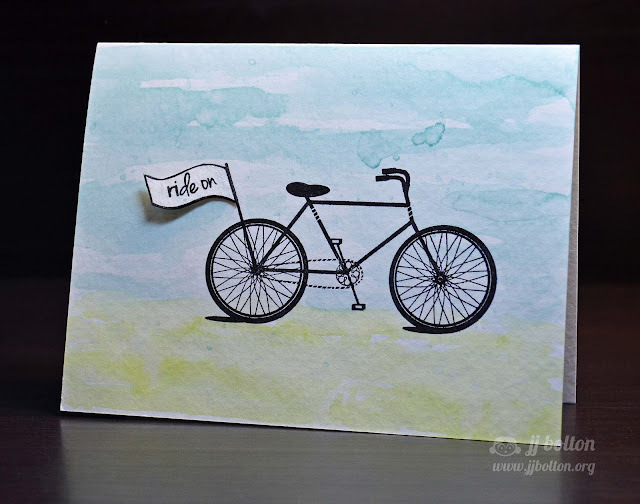 Great watercolor background, great bike stamp! Oh, I love how your background turned out. Perfect splattering, too! Now I see what you mean, JJ! Love the new release! I just love what you've done with the rain drop splatters Looks marvelous! lovely...the water color is perfect with your card...perfect. That bike is such a fun image and LOVE how you watercolored your background. 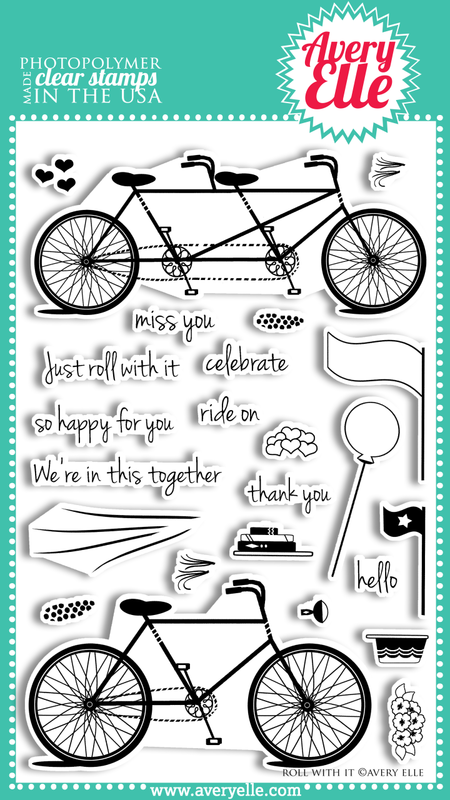 This is the best bike stamp set I've seen (love how it doesn't have a basket-making it perfect for more masculine cards). Your card is awesome. Your watercolored background is perfect for keeping it cas. JJ, I just love your style!! I feel like a broken record, but your cards are so clean and simple, they draw me in Every time. And that is exactly why I follow your blog posts. Love that background. Perfect CAS!! Fun! Your background is sooo cute! Love how you made your background! And of course the bike is so cute! Capturing the trend of watercolours in such a fun and fab style! LOVE LOVE LOVE the painted background!!! Really great card! Such a cool card, love the background! Lovin' the watercolor action, including raindrops - great idea to combine with a bicycle. I love the watercoloring work you did here! Beautiful!